Kimpton Hotels VP on global expansion of the boutique brand. Kimpton invented the concept of the boutique hotel more than three decades ago. And they show no signs of slowing down. Whether it’s an adaptive reuse or bold new construction, there’s a good chance Kimpton is coming to your town. The company has come a long way since Bill Kimpton opened the first boutique hotel in San Francisco. Now known as Kimpton Hotels & Restaurants Group by InterContinental Hotels, it’s no stranger to awards and accolades. There’s good reason for that. 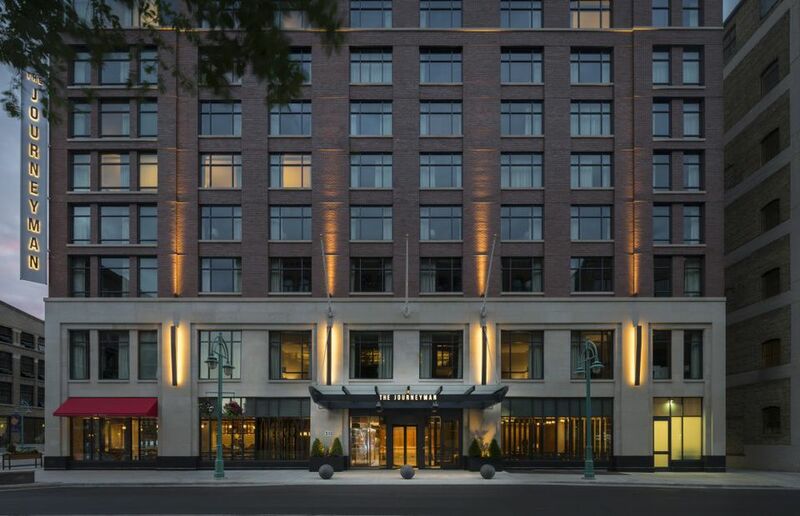 Kimpton has mastered the boutique experience with high-profile properties such as Kimpton Hotel Palomar in Beverly Hills, the Sir Francis Drake in San Francisco and the Kimpton Muse in Midtown Manhattan. Every Kimpton property is Green Key certified for its eco-conscious operating practices. There’s a complimentary nightly wine reception for guests to enjoy. And another big selling point: Every Kimpton boutique hotel is pet friendly. In fact, guests are invited to bring their pets, with no additional fee or deposit required. Basically, their motto is that if your pet fits through the door, it is welcome to come on down. Some properties even have dedicated Directors of Pet Relations. About.com spoke with Ron Vlasic, VP of Operations, about the brand’s growth strategy and distinctive new properties. Q: The Kimpton properties in major cities are pretty well known. Tell us about some of your hidden gems. A: The Taconic in Manchester, Vermont is one. It has 79 rooms set against the backdrop of the Taconic Mountains. I now oversee it. It’s phenomenal out there, a very pretty little place. Manchester is kind of a one stop light town. There are some high-end outlets there but not in the sense of a traditional outlet mall. I’ll tell you one funny thing. The “Most Interesting Man in the World” lives down the street. People do a double take when they see him. Q: You’re expanding a lot in the Midwest, right? A: Yes. Chicago is an obvious center of business. We have five hotels there. A few years ago we had the opportunity to take over the Minneapolis Athletic Club. We didn’t have much experience. But we developed it into the Grand Hotel. What we discovered is that there’s a natural travel conduit from Chicago to Minneapolis and back. It took off for us. It inspired us to look at other cities. Q: Tell us about The Schofield in Cleveland. A: We opened the Schofield in 2016. The city loved it. It was the newest hotel project in a long time. When we go to a city we don’t know, we try to extract what the city’s all about. We want to hit the right touch points. Basically, the property was an old turn-of-the century building. It’s gorgeous red sandstone. It was a shop with some residences upstairs. During the 60’s someone put an ugly façade on it. Then it was boarded up. We looked at it. We saw that it had good bones. It was on a corner that could be very prominent. We peeled away all the bad sheet metal to reveal this beautiful building. It was an adaptive reuse that really brought the local culture alive. It has 150 rooms. For the restaurant, our partner on the property had a friend who wanted to do the restaurant. We allowed him to come in and bring it all together. We also did something a little high end. The top four floors are residential. In Cleveland, nobody lives downtown. We wanted to attract professionals working downtown who don’t necessarily want to live in the suburbs. It’s been a successful venture. Now, we’re looking at other projects in Cleveland. Q: You’ve also opened The Journeyman in Milwaukee. A: The Kimpton Journeyman is a newbuild in the historic Third Ward of Milwaukee. It’s a beautiful corner lot. We approached it from the standpoint of character of the neighborhood. There is a group that protects the historic character of the neighborhood. We invited them to be a part of it. We told them our plans, our approach. The story of The Journeyman comes from Milwaukee’s roots as a blue-collar city. A journeyman of course was a person entering the trades. We wanted to pay homage to that person. We have 180 rooms; it’s a good-sized hotel. The rooftop has a beautiful view of all of downtown and the ballpark. You can see the lake. Summerfest is three blocks away. We have Heather Turhune as executive chef at Tre Rivali. Q: There’s an interesting story behind The Kimpton Gray in Chicago. Tell us about it. A: It’s two blocks away from the Kimpton Hotel Allegro, the largest in the group. A gentleman owned the old New York Life Building in Chicago’s financial district. It was virtually empty, only about ten percent occupied. He called me and we had our development guys come out. It was like a scene from “Mad Men.” The last time it had been designed or decorated was in the 1960s. But we realized that it had such potential. There were these enormous windows overlooking LaSalle and Madison. It took us about three years to complete the adaptive reuse. We used the footprint of the original structure. We worked with state and even federal agencies. They wanted to make sure that a lot of the unique elements of the building were kept alive. We’re proud that the architectural details of the building are still intact. Q: What are some of the features of the hotel? A: We have 293 rooms. In the lobby level, we did a great bar called Volume 39. All the old offices had beautiful law books in bookcases. We incorporated them. The bartenders are in white. It’s a really great atmosphere. As far as dining, it would have been easy to put in a steakhouse. But we came up with Baleo. It’s our rooftop venue that features South American food and drink with an Argentinian flair. Q: Will you continue on this adaptive reuse track? A: We’re trying to invest in second tier cities. That’s a strategy that’s working for us. You have someone from St. Louis who goes to New York and stays at our great boutique hotel, The Muse. There’s an interest in bringing that same experience back home. Prices in New York and L.A. are ridiculous. In places like Indianapolis or St. Louis, you can find wonderful buildings from the turn of the century. A great example is The Kimpton Cardinal Hotel in Winston-Salem. It’s the old RJ Reynolds headquarters and the precursor to the Empire State Building. This beautiful art deco building was sitting vacant. A: In Palm Springs we have a newbuild in the works. A developer picked up parcel where the mall was on the main street downtown. He tore it all down. Palm Springs is kind of a funny market. It’s known as a retirement community, but now it’s hip because of the modernist architecture. It presented a good opportunity for us. San Francisco is ungodly expensive, but we have a project in Sacramento. In Seattle we have a new hotel in the Belleview area. It has such promise, there’s a great movement of people living up there. We’d love to do something in Portland, but it’s been difficult to find the right project. Q: What other destinations are on your radar? A: In Philadelphia, we’re working on a project in the old navy yards. During the war they built all the big ships up there, but it’s been abandoned. It’s a little far from downtown, but the location inspired us. Sometimes you have to take that leap of faith. Q: What about cities outside of the U.S.? A: We’re trying to stretch beyond the U.S. We’re focusing on Europe. We have a project in Amsterdam that’s an adaptive reuse. It’s a unique experience to bring something like this to life. Cayman Islands, Kimpton Seafire Resort. Q: Any destinations still on your wish list? A: South America is on our radar. And Asia we’ve been working on quite a bit. My counterpart in San Francisco has been heading to Shanghai and a couple of other cities to explore some options. Q: You mentioned that you really pay attention to the needs and interests of your guests. What are some examples of that? A: We spend a lot of time internally on these issues. For example, over 50 percent of our clientele is female. We want to make sure all of our properties are safe and well-lit. That’s a big criticism of some of the W properties. The corridors are too dark. So, we’ll do a mock hallway to test things out. Also, I always try to convey the importance of signing up for our Kimpton Karma rewards program. It gives guests the opportunity to email us. We truly extract that information. Sometimes guests come up with cool ideas and we run with them. For example, some of our guests told us it would be nice if they had bikes to tool around in. So we put bikes in all our hotels. Another guest, an IBM executive, was staying at the Allegro. He told us the rocks glasses in the room were nice. But he didn’t like using rocks glasses to drink wine. So, we started putting wine glasses in the room. It made him feel like a million bucks to know he had brought about some change. We really do try to pay attention to what guests want. Six Senses CEO says they're expanding their unique brand of wellness.